A few years ago, former Bears center Olin Kreutz encountered a young but raw offensive lineman named Ronnie Stanley readying for his career at Notre Dame. Kreutz knew well that Stanley could ultimately become a dominant tackle because the man who would coach him was Harry Hiestand, his offensive line coach with the Bears for five seasons and a man considered one of the best at that job. Sure enough, Stanley became a consensus All-American in 2015 and was a first-round pick that following April. So, you can count Kreutz among those thrilled to see Hiestand back as the Bears’ offensive line coach. “Harry’s one of the best technique coaches — if not the best — anywhere in football,” Kreutz said. “He believes in what he teaches. He’s going to teach them the right way. … Harry Hiestand just wants to coach offensive line play. He loves it, he loves the room. He brings a great family atmosphere. And really, that’s what offensive line football is. 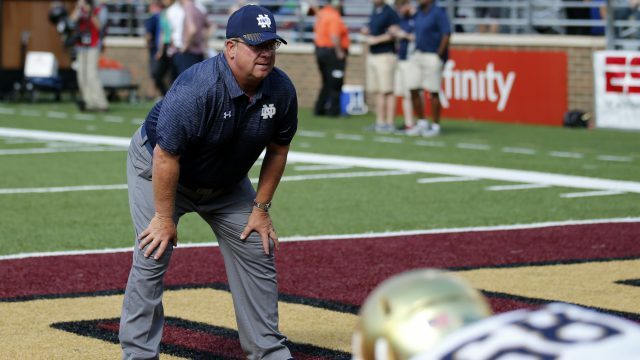 The 59-year-old Hiestand spent the last six seasons coaching on Brian Kelly’s staff at Notre Dame, where he developed linemen like Stanley, Zack Martin, Nick Martin and Chris Watt into NFL players. The Fighting Irish will soon produce a pair of first-round picks in guard Quenton Nelson and tackle Mike McGlinchey. Matt Nagy made Hiestand his first staff hire just days after being named the Bears’ new head coach. It was a hire that stands to benefit the likes of Kyle Long, Cody Whitehair, Charles Leno and whatever addition is to be made this offseason. Hiestand has a tremendous reputation of developing individuals and offensive lines as a whole. There are questions on the Bears’ offensive line, starting with the health of Long after surgery to repair a herniated disk in his neck. There could be additional procedures for him later this offseason. Veteran Josh Sitton faces an uncertain future after dealing with an ankle injury in 2017. With Hiestand in charge, the Bears can hope for the development of a dominant offensive line to protect 23-year-old quarterback Mitchell Trubisky. “Harry just does a hell of a job knowing what the player needs, knowing what they do well, asking them to do that and developing guys,” Kreutz said.